Is Flame Retardant Plastic that much different? Hello. I am Lee Hinsley with Global Plastic Sheeting. 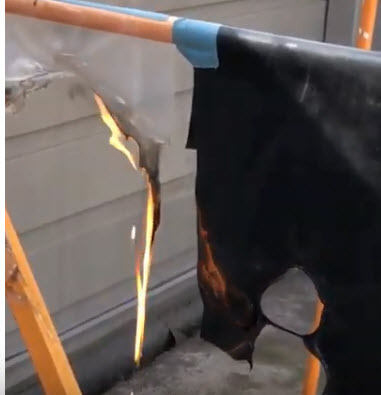 Today I would like to take this torch and show you the difference between fire retardant and non-fire retardant plastic sheeting. Unfortunately, I didn't have any 8 mil non-fire retardant film because we specialize in the Fire Retardant- but I will give you a little example here of how readily regular polyethylene burns. It has flaming drips which can spread fire. The smoke is toxic which is really not a good thing. You remove the flame and it continues to burn. Of course, if there is wind it can significantly add to that. Our black FR (fire retardant/ flame retardant) is very hard to first of all get to burn- but once you remove the flame it stops. This is a 2000 degree flame. So notice the non-flame retardant plastic sheeting/ film continues to burn. The black one I started a couple of times and it goes out. What is fire retardant plastic? Is fire retardant plastic sheeting really fire retardant? Visit this link to learn more about fire retardant films and which ones are certified and pass the NFPA test. Notice the non FR film on the left burns while the black fire retardant film does not.